New evidence has emerged showing that the inactivation or alteration of cancer suppressor genes can take place even if DNA itself remains unaltered. A known molecular mechanism for cancer development and spread is the inactivation of tumor suppressor genes, which encode various tools the body uses to keep its cells from turning cancerous. Changes in messenger RNA (mRNA) due to a process called intronic polyadenylation (IPA) can drive development of some cancers by altering gene expression in a way that interferes with the proper functioning of tumor suppression mechanisms. Evidence is building that the hobbling of tumor suppressors can take place not just due to changes in the DNA itself, but by alterations in mRNAs, which act as a go-between, translating the DNA code into its intended function in the body. 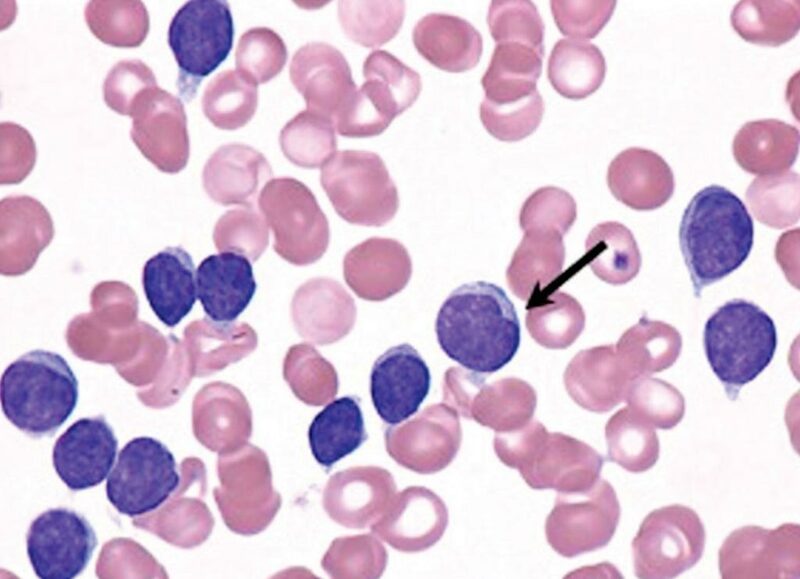 Image: A blood film from a patient with Chronic Lymphocytic Leukemia (CLL); a large lymphocyte (arrow) has a notched nucleus and demonstrates the variable appearance of some of the lymphocytes in CLL (Photo courtesy of Peter Maslak). Scientists at Memorial Sloan Kettering Cancer Center (New York, NY, USA) used an RNA sequencing method they developed to examine normal and malignant B cells from 59 chronic lymphocytic leukemia (CLL) patients. They found that the patients showed widespread tumor suppressor inactivation in mRNA even without a corresponding DNA alteration. The team reported that IPA truncated mRNAs in the CLL cohort predominantly affected genes with tumor-suppressive functions. In some cases (genes such as DICER and FOXN3) this appeared to result in the translation of truncated proteins, which lack the tumor-suppressive effect that they would have in their full-length form. In several other cases (CARD11, MGA and CHST11) the altered proteins even acted in an oncogenic manner. Overall, the team concluded that the inactivation of tumor-suppressor genes by aberrant mRNA processing appears to be significantly more prevalent in CLL, at least based on this cohort, than functional loss of these genes via DNA mutations. The authors also reported that they saw truncated tumor-suppressor proteins not just for known tumor-suppressor genes but also in previously unrecognized or relatively understudied sequences. The study was published on August 27, 2018, in the journal Nature.